The Walking Dead has had nearly as many showrunners as it’s had seasons, but it looks like the current showrunner Scott Gimple is going to stick around for the zombie drama’s fifth season. 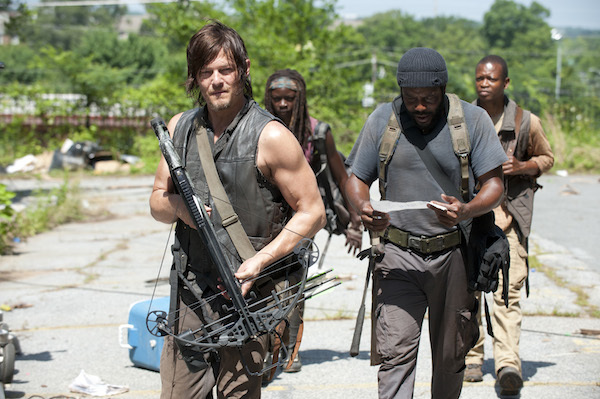 AMC has renewed The Walking Dead for Season 5, and given the series’ fourth season premiere ratings, that’s no surprise. But it certainly wouldn’t be an automatic assumption that the current showrunner would be coming along for the ride, as Gimple is the third to handle that crucial role during the course of the series' four-season run. TVLine reported the news of the series’ renewal and confirmation that Scott Gimple will remain as showrunner. Gimple was upped to showrunner for Season 4, replacing Glen Mazzara in the role. Mazzara took over for the series’ original showrunner Frank Darabont, who stepped down from the position during the summer of 2011, ahead of the premiere of Season 2. The Walking Dead returned earlier this month to massive ratings, with 16.11 million viewers turning in for the premiere. That number has slipped down a bit to somewhere closer to 13 million viewers for last Sunday night’s episode, but that’s still an impressively high number for a cable drama. It makes sense that AMC would be interested in moving forward with the show. The current season has taken a dark turn as an aggressive strain of the flu is taking lives. Death isn’t just the worst case scenario to the person dying, it’s also a threat to the living, as people who die tend to wake up with a pretty major shift in appetite. That can be a problem for people living together in prison. People are taking different approaches to how they’re dealing with the situation. That includes Carol, who can be seen with Rick in the above photo from next week’s episode, titled “Indifference.” And in the one below, we have a look at Daryl, Michonne, Bob and Tyreese, who are out foraging for antibiotics and trying not to get attacked by zombies in the process. Watch the preview and clips from Episode 4 of Season 4 here. The Walking Dead airs Sunday at 9:00 p.m. ET on AMC.